This Russian Borscht recipe (Красный борщ) is an authentic soup recipe. It’s made without many of the strange additions and shortcuts you can find in many borscht soups today. 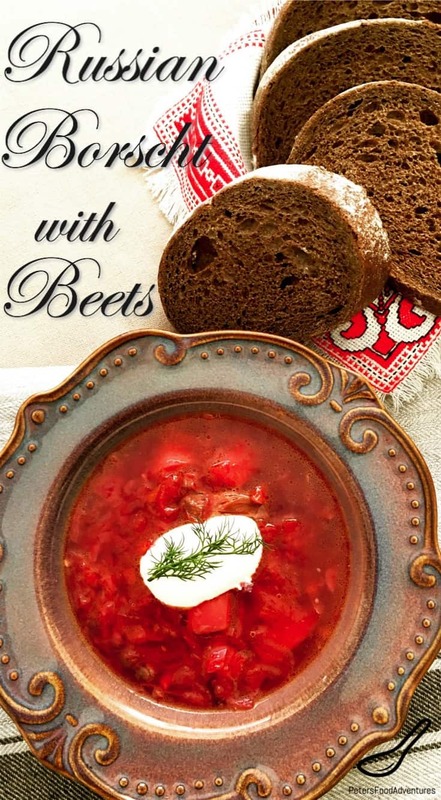 Don’t be fooled with weird additions, trying to pass off as traditional borsch recipes. I’ve heard people added Ketchup, added brown sugar, and even balsamic vinegar, (which is Italian by the way), all added into borscht. Even a certain celebrity chef added green apples to his beet borscht recipe. I’m sorry, but that just sounds crazy. I suppose you could really throw anything you want into soups if you wanted to. That being said, it doesn’t mean you should. There are variations across Eastern Europe that make borscht with fish, chicken, pork, various vegetables and different spices. You can even throw in the beet greens for extra vitamins. There are many proper classic red beet borscht recipes out there, all having a common thread across our shared ancestry. 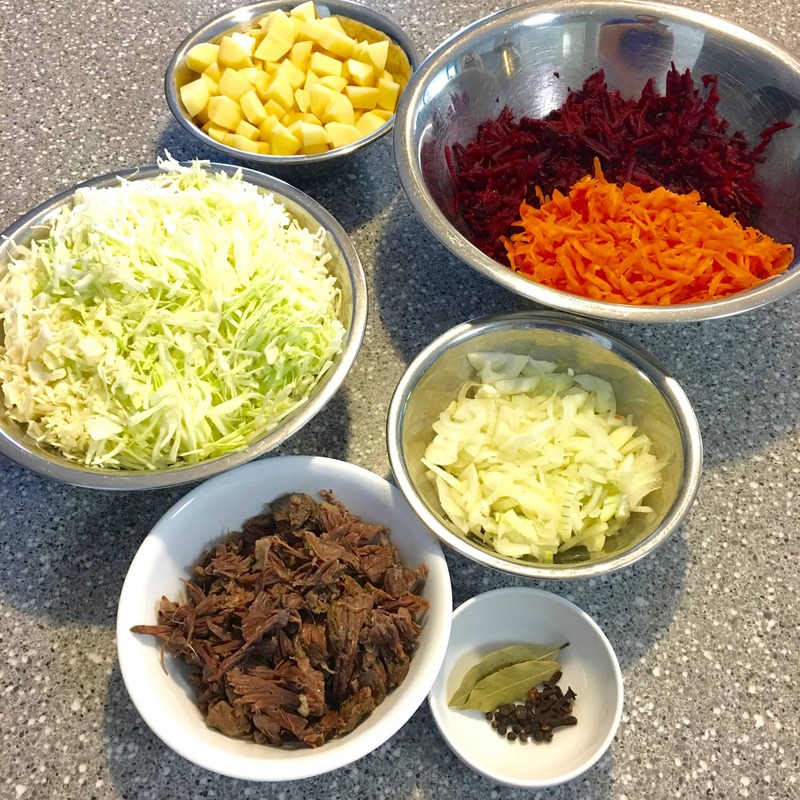 Borscht should have great meaty soup base made from scratch, fresh vegetables including cabbage, potatoes, onion, carrots and beets. Of course all topped with fresh dill and sour cream. The variations from this recipe are up to you, and do vary. It’s been enjoyed by Russians, Ukrainians, Poles and Eastern Europeans as a signature Slavic dish. Borscht is so popular, that it was even eaten in tubes by Soviet cosmonauts in space. There are many types of Borscht recipes, including Green Borscht made with sorrel leaves, a White Borscht, and even a Chinese version of this soup. Another popular Russian soup is Shchi Cabbage Soup, which is like a beet-free borscht. So it’s all kind of interconnected and separate at the same time, just like the politics (but this is a food blog). In Poland, this soup is called Barszcz, and in Lithuania, it’s called Barščiai, all similar, with small differences. Why Isn’t My Borscht Red? There are varying degrees of red when making Borscht Soup. As the color comes from the beets, add an extra beet for more color, especially if beets you’re using are small. Not enough beets will impact the color of your soup. Caramelizing the grated beets and carrots also add a lovely red colour and flavor, so I don’t recommend skipping this step. 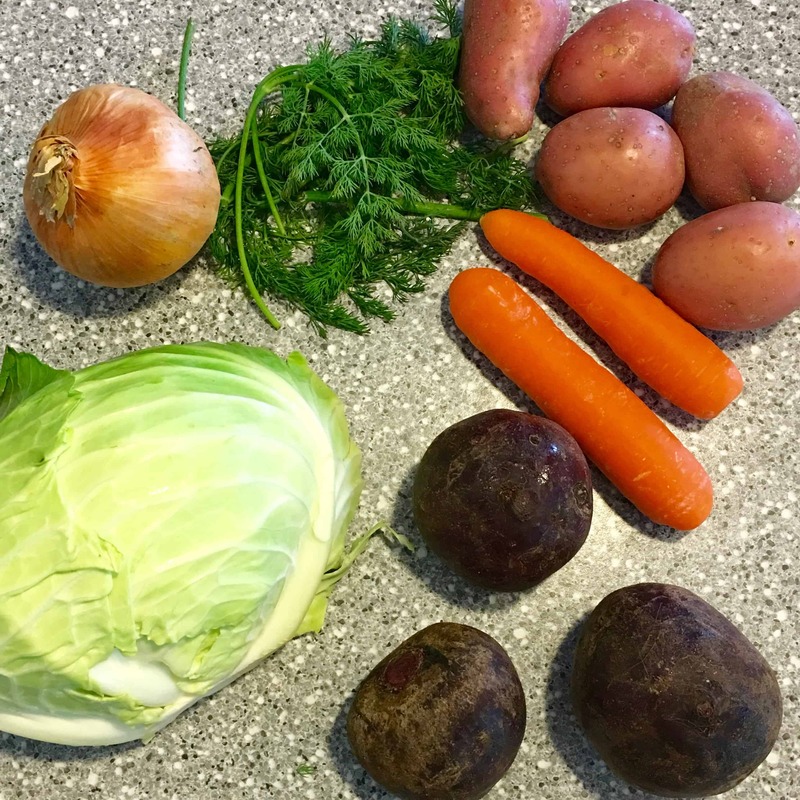 This is my wife’s Borscht recipe (Красный борщ) and she has been making it for me since we got married, almost 20 years ago. It’s definitely a family favorite, even the kids slurp up the vegetables. It’s a comfort food for them when they get sick. Who needs chicken soup, this is much healthier. Beet Borscht is a high in folate and managanese, and beets have even been known to reduce blood pressure. Beets have incredible health benefits. Try making a Russian homemade beet Kvass drink when beets are in season. Borscht is an incredibly healthy soup, full of vitamins and minerals. If you want a dish that’s synonymous with Russians and their food, it’s gotta be Russian Borscht with dark Russian Rye bread and homemade sour cream. Bon Appetit. Приятного аппетита! Fry onions until they are golden brown, set aside. Fry beets and carrots until they are caramelized, about 7-10 minutes, and set aside. Place 14-16 cups prepared beef broth in a large stock pot and bring to a boil. Turn down the temperature to a simmer. Add a bay leaf and the cubed potatoes, allowing to cook for about 10 minutes. Add the shredded cabbage and fried onions to the soup. Stir and simmer for about 5 minutes. Add the fried beets, fried carrots and shredded beef to the soup, stir and simmer for another 5 minutes. Add the red wine vinegar and salt and pepper to taste. Taste and add more vinegar and seasoning if necessary. Add dill and save some for garnish when serving. Serve with sour cream and dark rye bread. Place beef bones, celery stalks, carrots, onion, peppercorns, cloves and bay leaves into a large stock pot, fill with water and bring to a boil. Allow to simmer on low with a semi-covered lid for about 4 hours. (the longer the better).During the cooking process, skim off any impurities off the top while simmering. Strain the soup broth into a colander over a large bowl to remove the big bones and vegetables. Pick the meat off the bones and set aside for the soup. Using a cheesecloth (muslin), strain the soup again to remove the small impurities to make a clear broth. This is a MUST! I’ll definitely make this in this winter as with your green Borscht! Thank you for sharing, Peter. The pics are lovely! Thanks Rotwein! It’s a family favourite!???? Thank you for this recipe! Borscht has been on my to-cook list for ages, so I’m definitely saving this for autumn and giving it a try. Wow, I never knew that! Please enjoy the recipe, definitely heartwarming in the autumn and wintertime! Thanks for checking it out! ???? Completely new to Russian foods. My 3rd grade doing has Russia as her country in an upcoming World Fair. They suggest making foods from their country, so I thought this soup would be great! I have a questiion…on the printed out copy of the recipe, it states “bouquet garni of 6 peppercorns 1 bay leaf, 4 cloves. I didn’t see any peppercorns used in the video or the cloves. When do you put that in? Thanks in advance!